This’ll be the first review that I posted on the Wilson Combat series of 1911’s I’ll be shooting on the competition circuit and carrying as my daily carry gun. For those of you that don’t know I am a sponsor shooter with Wilson Combat, and to not disclose this would be misleading and dishonest. That is not my style. That said, my relationship and a member of their shooting team will not affect how I review their firearms. When owner Bill Wilson and I agreed I would represent the company, I made it very clear to them that I would only report with honesty what I found to be true, nothing more nothing less. If a gun had issues, I would say so. I have never owned a Wilson Combat handgun before, and when I had the chance to meet Bill Wilson at his Texas ranch to test and evaluate several of his handgun models, I was very impressed. A 4-inch gun with a full size frame make for a perfect combination of conceal-ability and shoot-ability. that. Each gun goes through a details inspection at each work station, and if it is not perfect, it never moves to the next cell. When inspecting the guns I shot at Wilson’s ranch, those on the production line, and the final guns shipped to me I found that the fit, finish, and attention to detail was comparable to the fully custom handguns I have had built before by renowned gunsmith Kevin Toothman. I have a high regard for “Toothmans” and for me to compare another handgun to his work is highly complimentary. So how do the guns perform? Of course that is the real question right? So, on to the R.E.A.P. test! 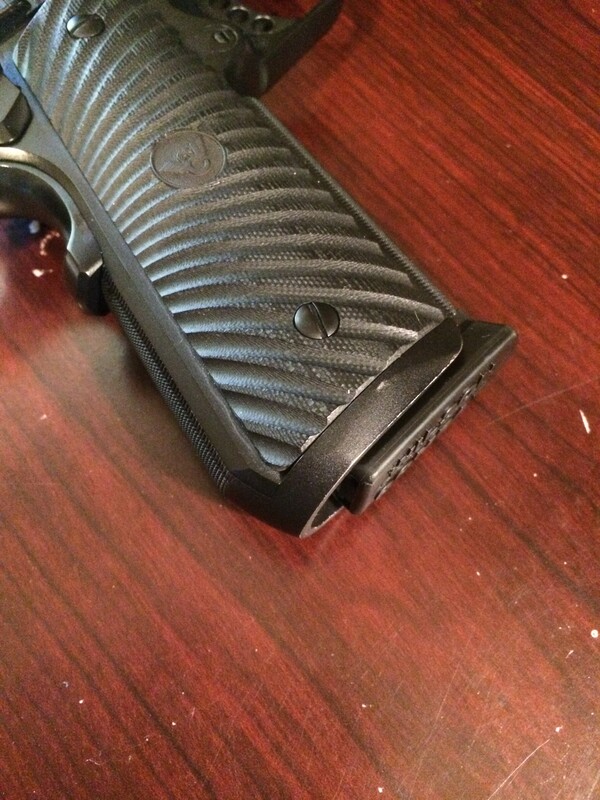 Wilson Combat 1911 magazine in 9mm. The best on the market. for this gun are unique in that I have shot it in classes in both California and Oregon while teaching. This means that I have repeatedly shot the gun and dropped the magazines in dusty and sandy range conditions, and I have not cleaned the magazines other than a shake here and there to let loose dirt out. The gun has ran flawlessly so far without any malfunctions, which honestly surprised me given the conditions I have shot it in, and the lack of cleaning. One key note is that I am running the Wilson Combat Magazines with the new metal followers, that are in my opinion a vast improvement over the previous model with plastic followers. The old magazines worked great, yet the metal followers improve feeding, prevent rounds from traveling forward in the magazines, and are easier to load into the gun when full and the slide is forward. A rounded rear backstrap and high friction grip panels make this gun easy to index and control when drawing. Ergonomics: 10– What can I possibly say about ergonomics of a 1911?! This gun has features and controls that are similar to a standard 1911 with the addition of an ambidextrous safety, and an undercut trigger guard (idea from Ryan Wilson, Bill’s son). The thumb safeties and grip are all demurred and smooth enough to operate for hours without any wear and tear to my hands. Slide release and magazine release offer ease of manipulation. This particular gun has a magazine well that is blended into the grip area and rounded slightly at the bottom of the magazine well, making it easier for me to index and drive my hand up the gun during the draw process. Grip panels offer good friction, but are not so aggressive that they rub sore spots on my skin or wear out my clothing. Front serrations as well as rear allow me to manipulate the slide for both reloads and press-checks in any manner I like. Overall, I love the ergonomics and feel of the gun. Accuracy: 10-Accuracy of Wilson Combat guns is unsurpassed for a gun that is built in production quantities. They guarantee a one inch group from the shop, and this gun delivers. Zeroing the gun on the first day produced a 10 shot group in one ragged hole from 10 yards. With accuracy like that, a 25 yard one inch group is almost guaranteed, although in truth, I value reliability over that level of accuracy. The thing that amazed me most was the accuracy delivered along with the reliability obtained. I would not have expected this from a 1911, in 9mm caliber (which in times past have been very finicky). Wilson Combat guns are shipped with their own test target, where the tester both grouped the gun, and made sure the sights were zeroed. A side note on this, I have both Wilson Combat handguns and rifles, and have to say that getting a gun fully zeroed from the box is refreshing. Power: 8-Power is a relative term, with the 9mm caliber being on the bottom side of the power curve in past times. Due to ammunition advancements, that has changed and I have seen several reports of current defensive specific ammunition returning ballistics that are comparable to a .45 ACP. So is a .45 ACP or even .40 S&W still superior to the 9mm? Probably, but in terms of bang for buck, recoil control, and affordability in terms of buying training ammunition, I still tend to lean toward (and carry) a 9mm. For me, it simply makes sense. So in terms of power, I had to rate this gun lower than I would have had I tested the same gun in .45ACP. If you are carrying one in the woods of Montana and hiking Bear Creek near Ennis Montana with a chance of running smack into a brown bear, then opt for the .45ACP with +P+ something or another. But if your daily carry is Oklahoma and the likely threat is a human thug trying to hurt you, the 9mm will be just fine, especially with the new 10 round magazines. Summary: I love this handgun. I have four Wilson Combat handguns as of right now, and one other is the lightweight rail model (review coming soon) they make, but this one is probably my favorite so far. Why? Simply because I like 1911’s, and favor the compact guns. Additionally, I love the way this one looks. The black finish and unique grips along with its model name, the Professional all appeal to me on a subconscious level for some reason. 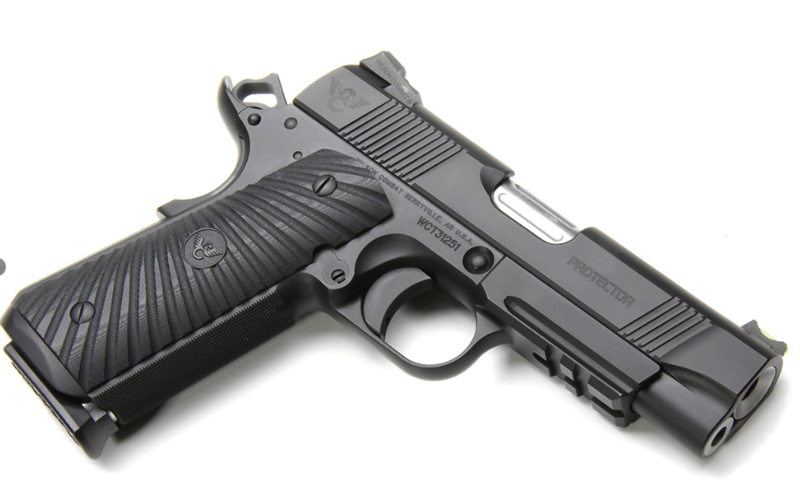 Price: Wilson Combat guns are not cheap. I didn’t want to skip over this, because the truth is that some of you might not be in a position to spend well over a thousand dollars for a handgun. When I was a 24-year old police officer in Knoxville Tennessee, making less than 30K a year, I could not either. But I can tell you that when the time is right for you to get a gun custom built for you, Wilson Combat is the shop I would recommend, right alongside the best gunsmith I have ever used, Kevin Toothman. 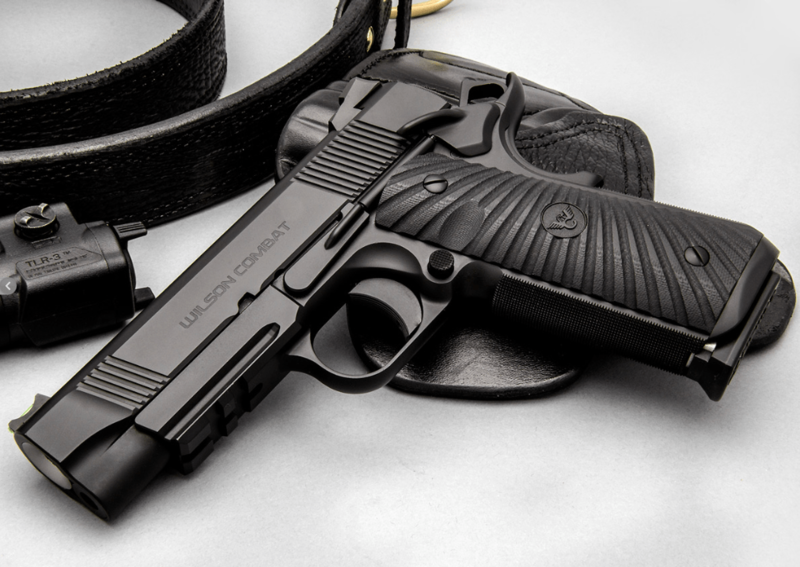 One unique thing about Wilson Combat is that they are very comfortable in the market they are in, they simply make the best custom handguns you can buy, and they don’t try to be something they are not the best at. There are certainly 1911’s on the market that cost much less, and even some I have had great success with in the past, like the Rock Island Armory handguns I competed with for two years (winning the BUG gun IDPA nationals with their compact 1911). But in the end, when you are ready for a custom gun built to your specifications and meant to fit you perfectly, check out Wilson Combat and build your own dream gun. You won’t be disappointed! Great review, I am interested in your opinions on carrying a high capacity poly 9mm vs carrying a 10 round 9mm 1911? 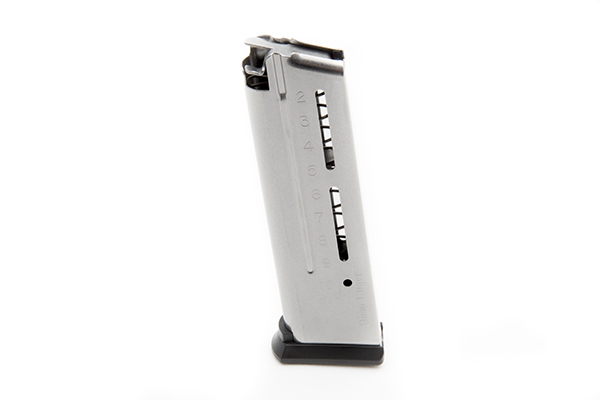 Many trainers recommend or prefer a higher capacity (in states where you can legally carry one) over single stacks. Also I know several trainers including Rob PIncus have stated that 1911’s especially compact ones have reliability issues, I believe Rob has even stated that he will waive the class fee if someone can finish his class with a compact 1911. So I’m just curious as to your thoughts and experience on 1911’s in general for carry, self defense and competition? I know you mentioned R.I.A. and the Wilson but as you also mentioned the Wilson is almost $4K and as also stated many can not afford to spend that much on a single firearm but I would expect a custom $4K gun to run flawlessly. I personally own several Dan Wesson’s and after a break in period they have for the most part been flawless. Great questions Todd. My carry gun has been a shield in the past so a 1911 with the same amount of ammunition is fine with me. The gun in that particular review is around 4K through it in training and 3 different training classes and is running 100% so far. ← A Different Twist On Home Defense – Manually Operated Rifles!